Ah, that made me cry. I always feel that when I try to describe my first tattoo that it sounds all sappy, but it's the truth. I'll never understand people who do that on a whim or while drunk/stoned. It's beautiful, and it is so very you! 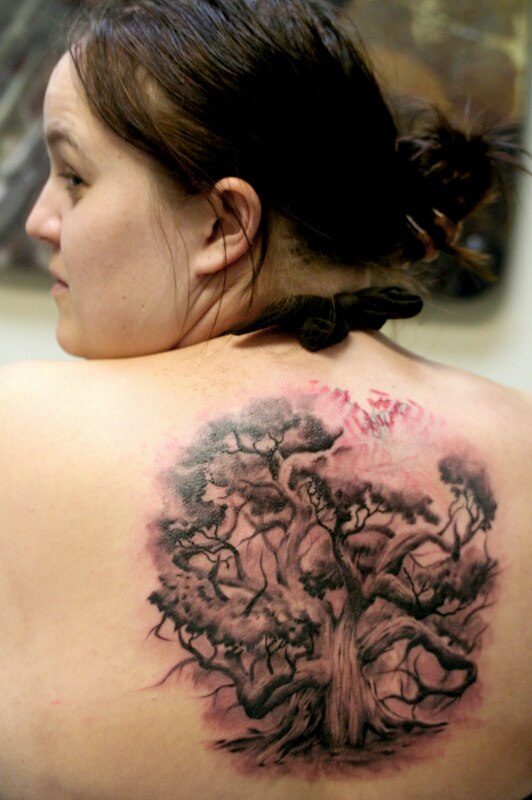 Great post, Kari and a wonderful tattoo! Glad your vision is alive on your back and in your soul! Wonderful work, Daniel! There is a reason it all fell into place. Good for you for knowing when to wait and when to jump! You are so brave Kari, to have endured the five hours of pain. With childbirth, you don't know how long it is going to take to get the little tyke out of you, but with this, you knew! The tree is beautiful as are you. I definitely love that tattoo, especially after reading this post. It's so you. Very, very cool, Kari. 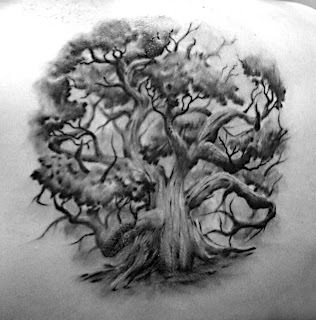 Now that I have had my tree on me for about 5 years, I am very shocked sometimes when people notice it in public and ask to see it. It is so much a part of me that I forget it is there. I forget that it is a surprise for some to see. They ask what it is and why I got it sometimes, it is not a simple answer to say 'it's my tree'. That tree is my symbol for me. You already know that when I got my tree it was a big transition period in my life and it would have not been the same without it. I know that my life would have been different had I not chosen to do it right then. I am so happy that it is there for you. It is a constant reminder. However much strain you put on your neck to see it, you can always feel it if you focus. Remember that it is there for you. You alone. It is a reminder of your strength. Your strength is as permanent as that tree. Oh sappy sisters.. I love you .-.